Fighting evil by moonlight! Winning love by daylight! Doing other things, one assumes, by other types of light! Sailor Moon has come to Hulu, and it’s all sorts of remastered early-’90s anime fun. It’s a Japanese cartoon in which a klutzy schoolgirl named Usagi transforms into a superhero named Sailor Moon. When she’s Usagi, she has self-esteem issues, but Sailor Moon always introduces herself by announcing, “I am the pretty guardian who fights for love and for justice!” Maybe it’s me, but I think it’s conceited to tell everyone how pretty you are: Let them decide for themselves, you know? Usagi/Sailor Moon also has an array of special attacks that, in proper anime fashion, only work if she shouts their names when she deploys them. Hulu is airing a remastered version of the original Sailor Moon, not the edited version that aired in the U.S. in the 1990s. Sailor Moon is called that because she’s one of the legendary Sailor Senshi, who all wear sailor outfits. Usagi also wears a sailor outfit when she’s not being Sailor Moon, but that’s because it’s a uniform worn by Japanese schoolgirls. It’s slightly different from Sailor Moon’s, but not, in my opinion, different enough to excuse people for not recognizing her. Neither identity seems that interested in doing any actual sailing. There’s also a talking cat and a mysterious love interest named Tuxedo Mask who shows up to save Usagi pretty regularly. Later in the series, a whole cosmology of Sailor Senshi show up, from Sailor Mercury to Sailor Pluto. (This was before Pluto stopped being a planet.) Alas, there’s no Sailor Earth, which seems like a missed opportunity. Sailor Moon ran in Japan from 1992 through 1997; a dubbed American release arrived in 1995. But, as was the tradition at the time, the American version was subject to a wide variety of edits and changes that made it unacceptable to purists. These purists were probably pretty annoyed when the adulterated version was a huge hit and did a lot to acquaint a generation of American kids with Japanese anime. 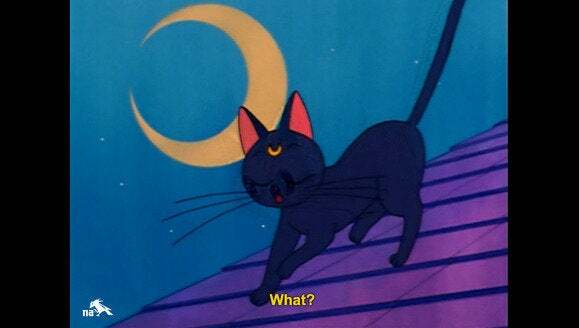 Sailor Moon is a classic. Sometimes, that means that a lot of people saw it when they were young and impressionable, and that’s certainly part of the show’s appeal. But the show is also important in the history of anime, because it was essential to the rise of “Magical Girl” shows. And this version on Hulu is, by all accounts, better than the one that was shown in the United States back in 1995. For one thing, it’s remastered, which means that it looks great, and the English subtitles are all new. And it’s uncensored, which means that, for example, Sailor Neptune and Sailor Uranus will be lovers, as they were in the original Japanese . The original English adaptation made them cousins, which seems like it probably led to some weird interactions. The producers probably had to change a lot of dialogue to make that work. Luna is a talking cat that usually has more interesting things to say. So if there’s a version of Sailor Moon you’ve already seen in English, this will be just like that, except more authentic and with crisper images and sound. And if you didn’t see the original, you can watch this one and automatically feel superior to the people that saw it in the 1990s. If you didn’t come of age at the right time, the animation in Sailor Moon might be a little cruder than what you’re used to. And it’s not really a match for the complex storytelling available these days. It’s essentially a kid’s show from 20 years ago, so if it doesn’t hit your nostalgia button, it might just feel impossibly old-timey. It’s also possible that you’re the right age, but you just don’t like watching subtitled anime. Pretty charming. There’s a reason that Sailor Moon led to an explosion of Magical Girl anime shows, though most of its successors aren’t as good as the sailor-clad original. It’s also exceedingly light fare, so it won’t bring you down the way binge-watching The Wire would. You’re allowed to watch things for fun once in a while. Only one, because Hulu plans to add two episodes every week. But start by binging all the episodes Hulu has so far, which at the moment is…four. So the binge will be kind of a slow start. But Hulu has the rights to all 200 episodes of the series, plus some movies. So watching two episodes could be your regular Monday activity for a couple of years. Or until Fall 2014, when there will be a new Sailor Moon release on Blu-Ray and DVD, featuring the new English subtitles or an all-new English dub. But that’s so far away—who knows if fall is even going to happen this year? It’s probably best to watch them online.